The Football Association has been criticised for “unfairly” charging Jose Mourinho for swearing. 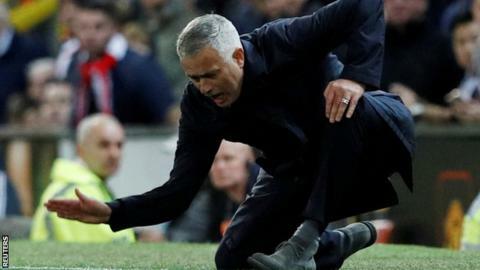 The Manchester United boss was charged after he was picked up by a television camera swearing in Portuguese following a 3-2 win over Newcastle on 6 October. But it concluded the FA had “acted in good faith” and not “singled him out because of any bad feeling or bias”. However, to charge the United boss for his actions was deemed to represent “a material departure from previous practice for which no good justification has been provided,” the panel wrote. The panel did accept the FA was “in a difficult position in trying to police bad language and offensive gestures on and off the pitch”. After Mourinho successfully appealed the initial charge of abusive and/or insulting and/or improper language, the FA appealed. An appeal board allowed the appeal – but also wanted a new regulatory commission to look at whether Mourinho had a “legitimate expectation” not to be charged, based on what the FA had done previously. And that independent panel, in its written decision released on Monday, said there should be no charge against the 55-year-old. “Following the appeal board decision, and the most recent decision of the independent regulatory commission, the FA now considers this matter to be closed,” said a statement from the governing body.